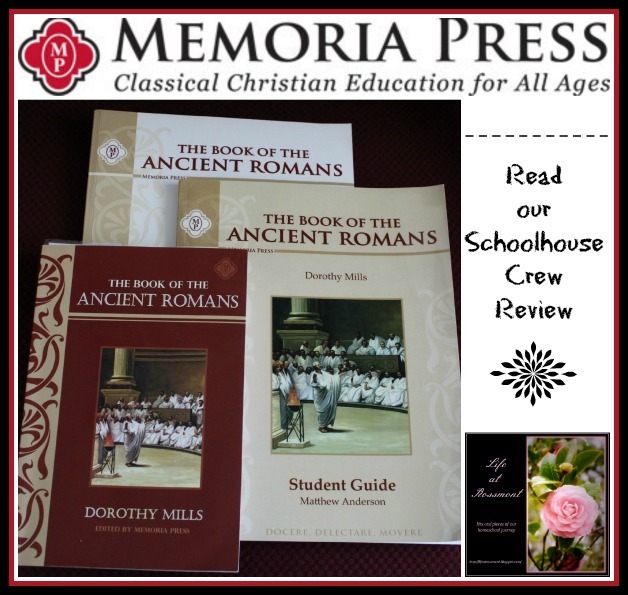 Do you use the Christian Classical Education method in your home school? Memoria Press has many products especially suited to your needs. The past few weeks we have been using the Poetry, Prose, & Drama: The Old English & Medieval Periods Set. 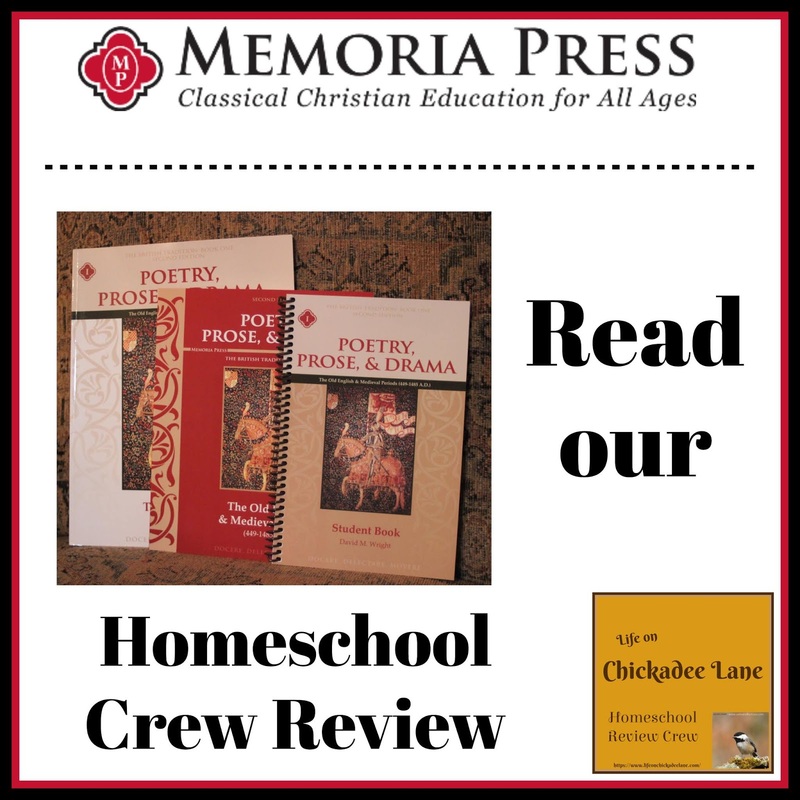 This Poetry, Prose and Drama set includes the Poetry, Prose, & Drama Book One: The Old English & Medieval Periods, Second Edition; the student guide; and the teacher's guide. This is written for grades 8-12. The anthology contains readings of introduction providing background information for the time period and historical context of the poetry. It discusses literature of the warrior; priest; medieval church and its people; and of the common people. It's broken into two segments: from the Anglo-Saxon Invasion to the Norman Conquest, and from the Norman Conquest to the Accession of the Tudors. It fits well with the history course we are currently using. The student book provides introductory material, instructing how to use the guide. There is a "basic features and background" section, which provides definitions to various terms used throughout the course. It describes what the Central One Idea is, and the stages of determining what that is for each reading. There is also a brief description on "how to mark a book." For each reading, there are comprehension questions, words to be defined, socratic discussion questions, and writing assignments. The teacher's guide contains the same materials as the student guide, but provides the answers to the comprehension questions, socratic questions, definitions to the vocabulary words, etc., in the margins. To be honest, we never did get the hang of marking the readings as we went. So, mostly I just read the information to SJ. One feature I really like in the anthology are the timelines at the beginning of each time period section. Much of the information provided in the introductory, background readings is information we have covered or are covering in our history program, so we just quickly skimmed through it. We did attempt doing some underlining. Mainly, I suggested he underline the sentences in which he could find the answers to the comprehension questions. The student book provides steps for working through each reading. First there is the pre-grammar/preparation step, in which your student will prepare to think about the poem and its Central One Idea. This is followed by grammar/presentation, which provides: reading notes; and words to be defined, along with definition bank. Then your student is instructed to read the poem, marking it as he reads, then answer the comprehension questions afterward. We went over the comprehension questions orally. Then there is the logic/dialectic step. This is where the socratic discussion questions come in. Again, we went over these orally. There is the option to have your student write them out instead. Here your student may be comparing, contrasting, and connecting ideas from the poem. The final step is rhetoric/expression. Now your student will write: the Central One Idea; central quote; a brief paraphrase; etc. There are also instructions for writing an essay. Well, writing is extremely challenging for SJ (due to his receptive expressive language disorder), so again, we just went over this orally. 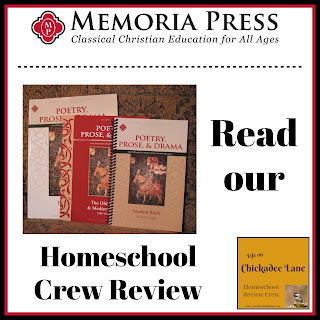 I will admit, we aren't really a "classical education" homeschool (we're more of a literature based/theme/unit study family). Also, I found this far more challenging than I thought it would be for SJ, because of his learning challenges. Also, he is much more a "numbers kid." Now, this might have worked well for my 19 year old, who is much more a linguistic. Check it our for yourself. Read the other Crew members' reviews, too. 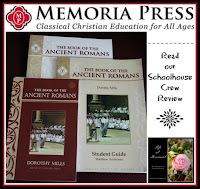 A few years ago, we reviewed The Book of the Ancient Romans set, which was our first (and only other) time to review for Memoria Press. Members of the Crew reviewed these various products. To learn their thoughts and how they used the products in their families, click the banner below to read their reviews.